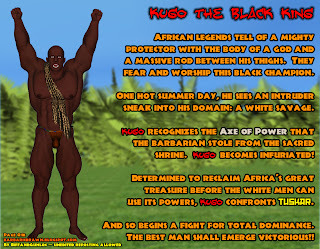 African legends tell of a mighty protector with the body of a god and a massive rod between his thighs. They fear and worship this black champion. One hot summer day, he sees an intruder sneak into his domain: a white savage. Kugo recognizes the Axe of Power that the barbarian stole from the sacred shrine. Kugo becomes infuriated! Determined to reclaim Africa’s great treasure before the white men can use its powers, Kugo confronts Tuskar. And so begins a fight for total dominance. The best man shall emerge victorious! !